I have a favorite recipe for rolls. I’ve made regular dinner rolls from it and the original pull apart dinner rolls which are present at every holiday celebration in this house. 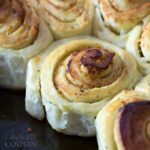 Because it’s such a great recipe, whenever I come across a new idea for rolls, I always use my tried and true favorite. 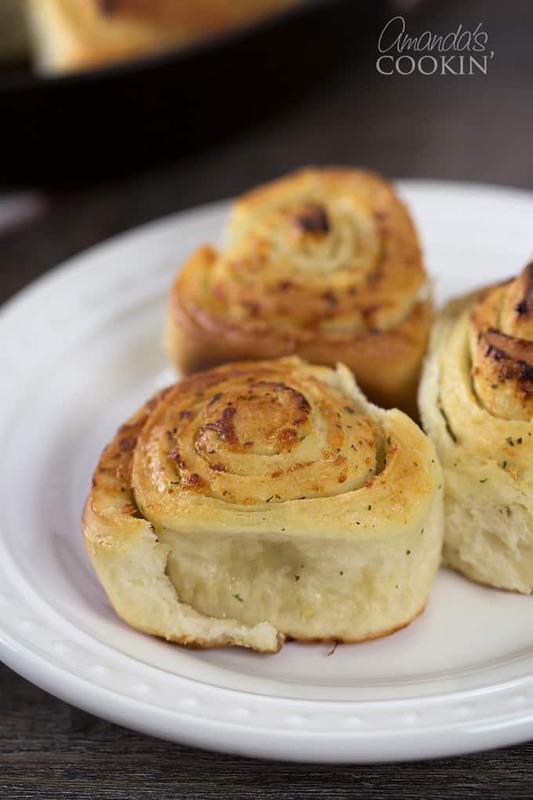 This new favorite I’m calling Parmesan Garlic Rolls is no exception. In 2011 I stumbled across a recipe for garlic cheese rolls on a blog called Raptor Toe. That blog is gone now, and the original recipe along with it. It was in my bookmarks for quite some time, and while looking through them one day the name caught my attention. I decided to use my roll recipe for these and made my own garlic butter. I made a couple other changes too but definitely drew inspiration for my parmesan garlic rolls from that recipe. 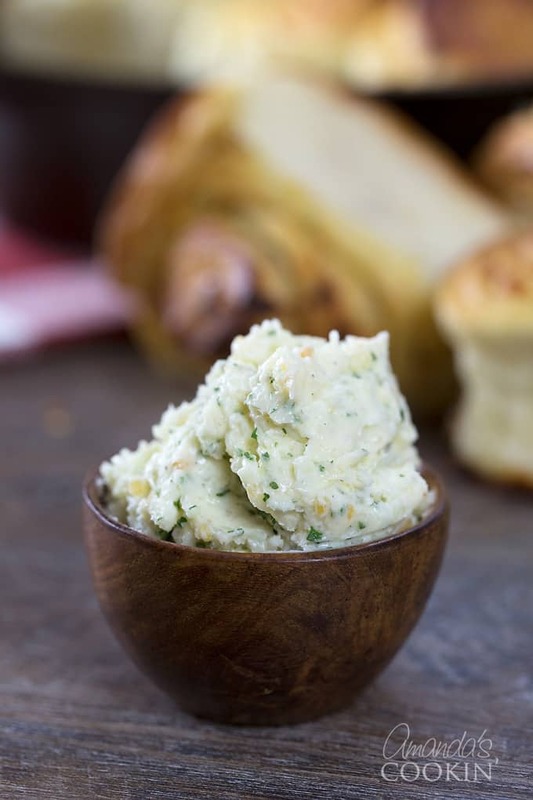 While waiting for your dough to rise, make the garlic butter. Set it aside to let the flavors meld. The butter itself is amazing. Don’t leave it around your kids or they’ll be eating it on its own! 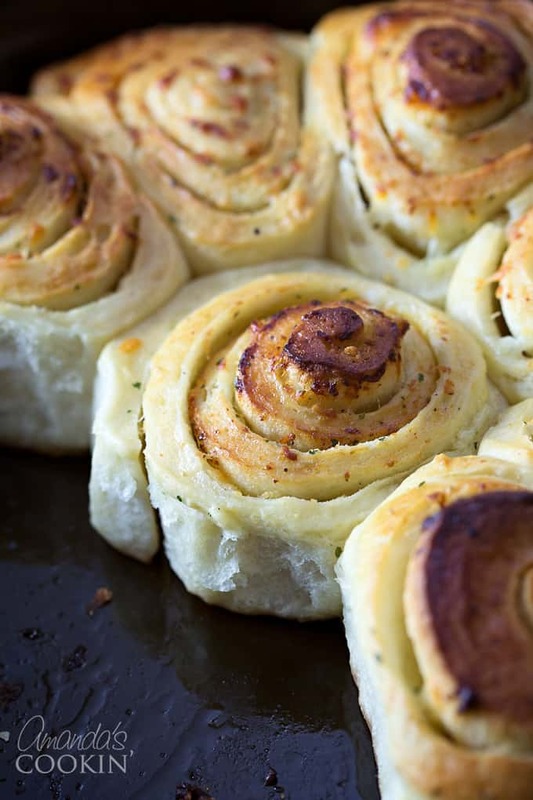 Make sure they wait for these parmesan garlic rolls to come out of the oven. 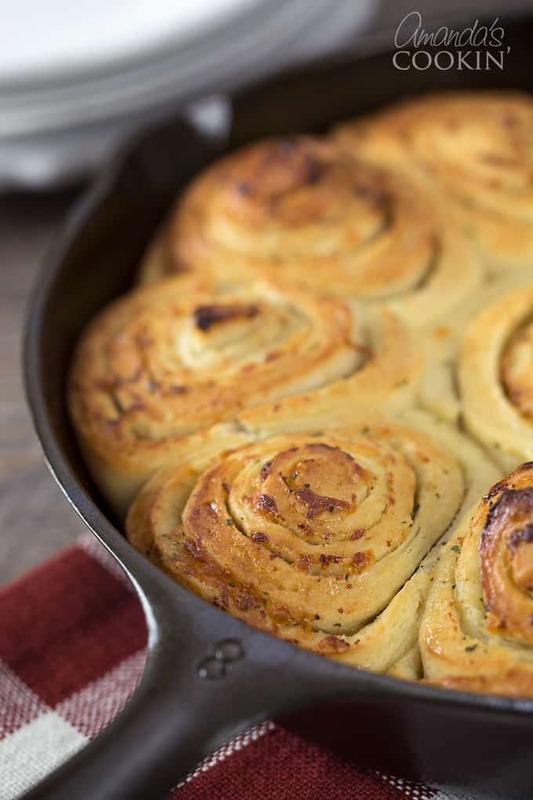 My parmesan garlic rolls are perfect served with a big bowl of steaming pasta. They are also a great accompaniment to a hot bowl of soup or chunky stew. You probably won’t have any leftovers either. As I said before, this is my favorite bread dough for homemade rolls. I hope you love it as much as we do. After your dough has risen, punch it down and place it on a flour dusted work surface. Dust the top of the dough with flour. Use your hands to flatten the dough out to a 14×10 rectangle, then spread with garlic butter. You will NOT use all of this butter, just enough to spread a generous layer on the dough. Roll up the rectangle and wrap in parchment paper. Chill in the freezer for 15 minutes. Meanwhile, mix together your Parmesan and parsley. Next you’ll slice the rolled dough into discs, just like you do with cinnamon rolls. Place them in a baking pan, or in two cast irons skillets. I used one skillet and one stoneware pan of the same size. You’ll brush them with melted garlic butter and sprinkle them with parsley-cheese mixture. Cover them and let them rise 20 minutes, then bake! Be sure to let me know if you try them and what you thought. Enjoy! 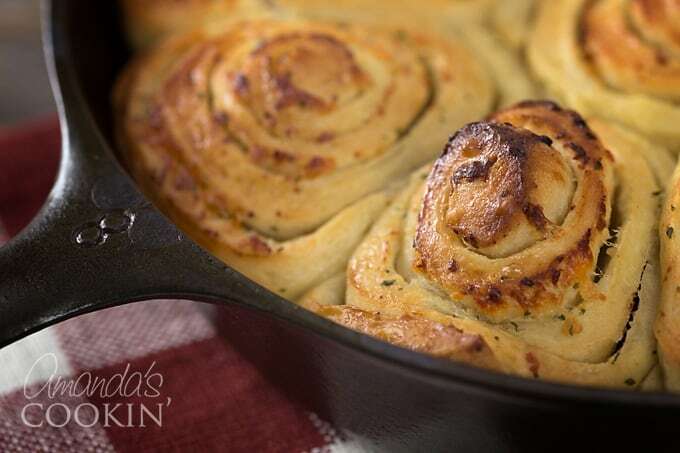 We love making these parmesan garlic rolls, they go great with any pasta, soup or stew! Dissolve yeast in warm milk with sugar in electric mixer bowl. Stir in 1 cup flour, oil, and salt. Beat until smooth. Stir in enough remaining flour, scraping dough from side of bowl, until soft dough forms (mine always requires all the flour, your climate may act differently). Cover and let rise in warm place until double, about 45 minutes. Beat butter in mixer until creamy. Add remaining ingredients and beat until well combined. Transfer to a small bowl and let sit to let the flavors meld. You will NOT use all of this butter, just enough to spread a generous layer on the dough. 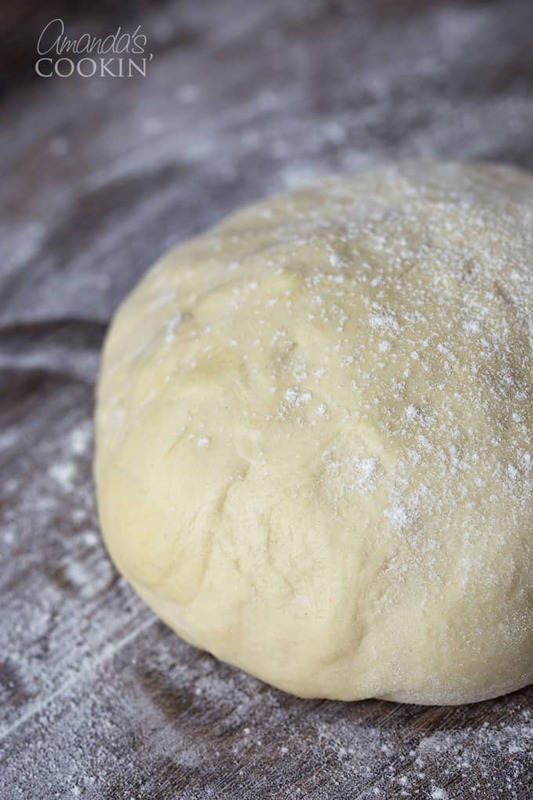 Punch down dough in center and fold over a few times. Prep two cast iron skillets or stoneware bakers, or a 13×9 baking dish with non-stick cooking spray. Lightly flour work surface and place dough onto it, then lightly dust top of dough. Press dough out onto floured surface to create a rectangle. Keep turned and pressing until you have a rectangle approximately 14 inches by 10 inches. 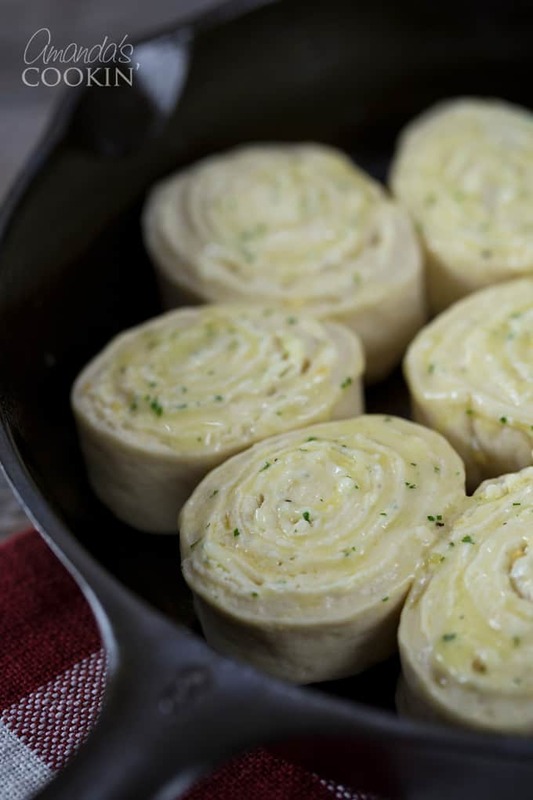 Spread the dough with a generous layer of garlic butter (you WILL have butter left over, just use enough to add a layer to the dough) and sprinkle with freshly grated Parmesan cheese. Sprinkle with a little Mozarella cheese. 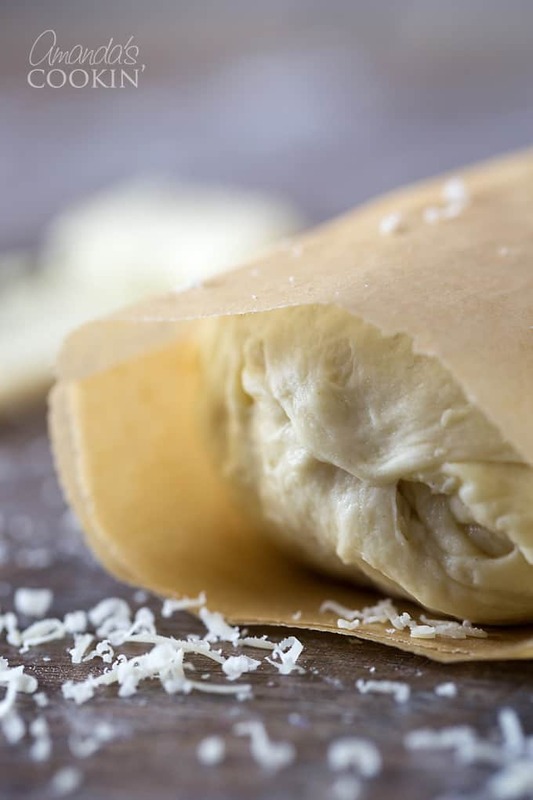 Roll up dough and wrap in parchment. Place in freezer for 15 minutes to chill. Meanwhile, store the remaining garlic butter for another recipe, leaving about a tablespoon in the original bowl. Microwave the original bowl with remaining garlic butter until melted, about 20 seconds. Chop up some fresh parsley, about a tablespoon and combine with 2 tablespoons of freshly grated Parmesan. Toss together to combine. Slice into 1 1/2" discs. Place in prepared pans. Brush tops with melted garlic butter, then sprinkle with a Parmesan/parsley mixture. Cover with a clean towel and allow to rise 20 minutes. Place in oven and bake 15-20 minutes. These are like the Cinnabon of the savory world- totally delicious and 100% addictive. I can smell them already! I haven’t ever make bread or rolls . but I would love to make this. praying I can make them as good as yours looks. Do you use about half the garlic butter? If so, I will only make half. Anything like that which goes in my fridge never to be found again. I think that would work fine, I haven’t made these in a while so I’m sorry I don’t have an exact measurement! Using half the amount for the spread was just perfect! They turned out super. Doesn’t matter if there is left over “special butter”! The rest of it will go on Toast!!! Also I can see putting cooked, crumbled bacon on after the butter, and before you roll it up. What do you think of using that idea for an appetizer or for accompaniment to a Soup Dinner? I love that idea! I think the addition of bacon would be great! these are sooo good! recipe is an easy-to-follow, no fail recipe! i’ll be adding this to our gourmet bread menu. thank you so much for posting! This will be so nice with soup, here in australia its quite cool so soup is the thing in winter. Thanks for sharing it. Directions are vague and should be clarified. It doesn’t say how much garlic butter to use. I used the whole batch and ended up with big problems! Oh Drew, I’m so sorry. I read through the recipe and you’re right, i should have been more specific. You basically just use enough to spread a layer of butter on the dough. I will make corrections, so sorry about that!